You’ll need a few things–heavy duty trash bags, protective gloves, sharp utility knife, dust mask, and a crowbar, and for removing padding glue or staples, a flat floor scraper or padding adhesive remover. Remove all the furniture from the room, as well as floor vents, and any under shoe molding. Vacuum very well to remove as much dirt and dust as possible. If there is a room door that swings inward, take the door off the hinges to keep it out of the way. Suit up with the dust mask and the work gloves, and start in a corner, pulling a section back with the crowbar, taking care to be mindful of the tack strips that can be holding down the carpet around the perimeter of the room. Remove the tack strips with the crowbar if you have hardwood floors under the padding that you plan on refinishing. Start in the middle of the strip, loosening the nails, and work towards the ends. After the tack strips are out, tackle the padding. Pull it up, cutting into sections the same way the carpet was cut. 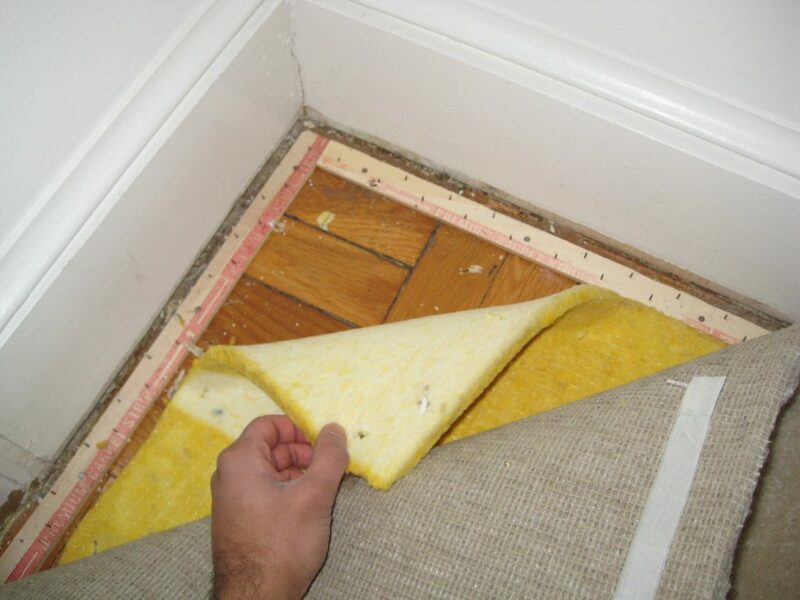 Some padding is installed with adhesive, and some is stapled to the floor. If there is glue remaining on the floor, follow the instructions on the carpet padding adhesive remover to get the glue off the flooring. The staples can be removed with the floor scraper. Remember that if you’re planning on recarpeting the floor, leave the tack strips in place, and remove the padding anyway, as most installers require new padding to be put down. Call your local municipality to find out how they would like for you to dispose of the old carpet, because the large amount may not be able to be picked up by the regular truck. Don’t hesitate to ask about recycling programs that are available, as virtually all carpeting can be recycled.